Another American Jazz musician (see the earlier Bill Coleman post..) who possibly enjoyed more success and professional contentment in Europe was pianist Freddy Johnson, born March 12, 1904. Johnson made many good records for Brunswick and Decca. The French (Paris) Brunswicks by Freddy Johnson and his Harlemites are really very good recordings – I’ve played some of them when DJing, including Harlem Bound recorded in Paris on October 14th, 1933. I’ve also played Jam With Bacon, which he recorded in 1938 on the Swing label in a sextet including Alix Combelle and Louis Bacon, and this rendition of Shine where you can more easily hear his piano work, recorded a year later in Louis Bacon’s Orchestra – in reality a seven piece studio group. His recording of “I Got Rhythm” was played to Louis Armstrong while aboard the ocean liner that brought Him to England. Louis was so impressed He wanted to meet these chaps. Louis and Freddy did meet in Paris and spent some good times together. Johnson recorded with an Orchestra in Holland led by Lex van Spall, tunes included Jungle Fever and I Want To Dance. 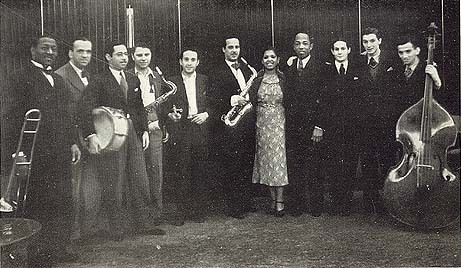 Here’s Freddy, 4th from right, with Lex’s Orchestra in 1934. Lex is 6th from right holding his sax and vocalist Rosie Poindexter is between them. 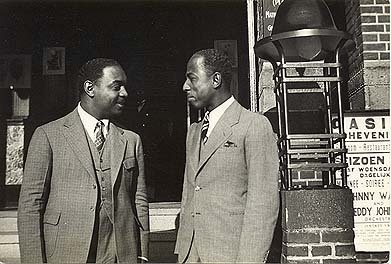 He went on to tour successfully in Europe and is seen here with Benny Carter in Scheveningen, Holland, in 1937. The poster just to the right is advertising his Orchestra’s upcoming appearance at the Casino in town.